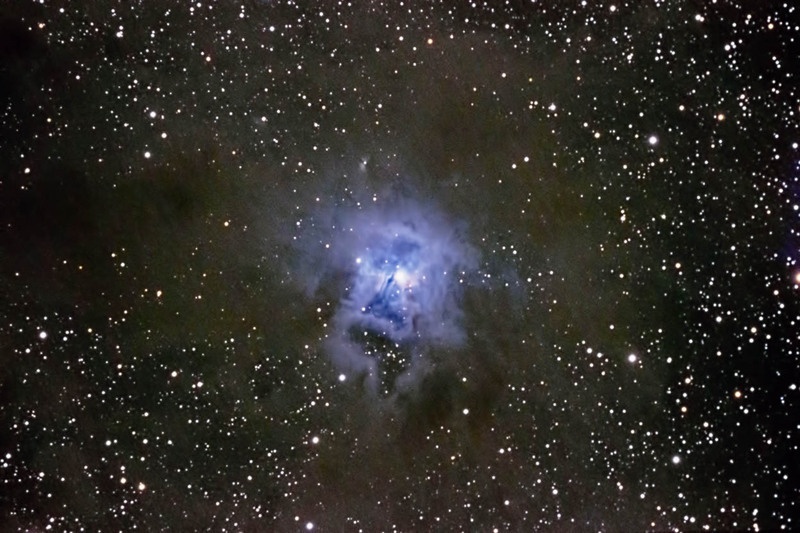 The Iris Nebula is located approximately 1300 light years away in the constellation of Cepheus, the king. It is a 60-light-year wide reflection nebula embedded within a large cloud of interstellar dust. It is illuminated by a very young, hot star (SAO 19158) that is 10 times larger than our Sun. NGC 7023 is actually the open star cluster within the nebulosity. The nebula itself is designated as LBN 487 or vdB 139. It was first discovered by William Herschel in 1794. Guiding: 300mm lens attached to Orion SSAG Pro. Images were converted using Photoshop Camera Raw. Subframes were aligned and combined with ImagesPlus. The combined image was adjusted in Photoshop. Topaz Detail and DeNoise were applied. Slight cropping was done. My backyard observatory in southeastern Minnesota on 9/3/15.